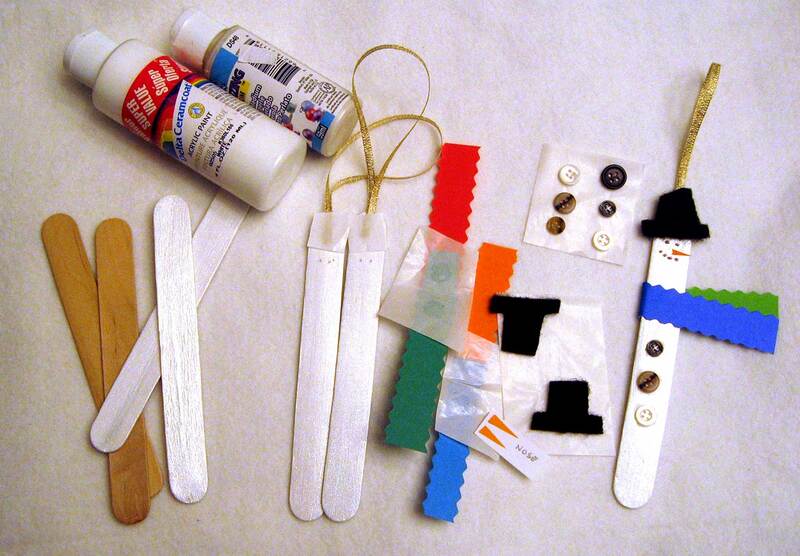 The snowman ornament kit for a Christmas Wishes Craft. One bottle of white paint. One bottle of pealizing medium for the icy sheen. Painted tongue depressors with a ribbon loop attached by a glue dot. The paper covering the top is to keep anything else from sticking to the glue dot. Also penciled in eyes for placement. Strips of paper with glue dots attached. Felt would be nice, too. Black felt hats with glue dot on the back. Buttons with glue dot backing. Black marker. Oops! Not shown. Actually I’ve prepainted the tongue depressors so the first four items aren’t in the real kits. As much as 4-5 year olds would love to paint and use real glue, I’m thinking of the mothers and the ensuing mess. This is supposed to be fun for everyone! This is my first time with glue dots so I’m anxious to see how it all works out. This entry was posted in Christmas, crafts, NaBloPoMo and tagged advent, Christmas, crafts, NaBloPoMo by Patti_is_knittinginflashes. Bookmark the permalink.